The last episode of New Girl, “The Decision,” was one of discovery: Schmidt and Cece realized they could host their wedding in any venue, because their love is the most important part of their forthcoming marriage. 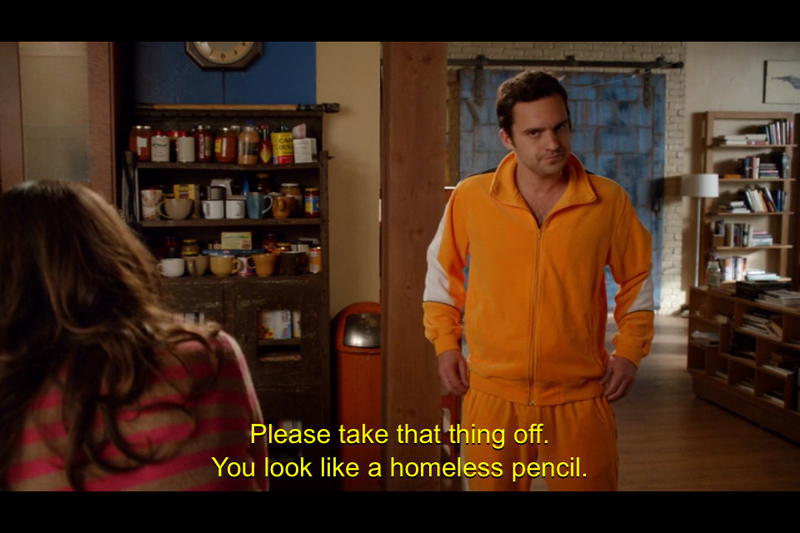 Nick realized his homeless pencil outfit is his best defense against poor choices. And Winston, finally free of the gravitational pull that is Reagan’s sexuality (however difficult it must have been) realized he has a serious thing for his partner, Aly. Sure, Aly may have a boyfriend, but she said that Winston has kind eyes, and that’s nothing to moonwalk out of a room about. It’s inevitable that he will sweep her off her feet, so where does Aly rank in the history of Winston’s significant others? KC’s start on the show was promising, but she was in all of two episodes, one of which it was revealed she was cheating on Winston. She may be the most forgettable of his girlfriends, but she did make Winston strip in front of her coworkers, which is ultimately a major win for us. An uber-busy career woman, Daisy rarely had time to care for her cat, let alone tend to her relationship with Winston. Her no-nonsense style (not to mention her wandering eye) was ultimately too intense for Winston to handle, though it’s safe to say he got the best of all parting gifts. Fresh off his break up with Daisy, Winston meets Kylie while shopping for his new pet, and the two immediately hit it off. In another world, Winston, Kylie, and their cats could have been quite happy together. However, their one evening of passion suffered from an extreme kind of misunderstanding, and no one got laid that night. There’s something to be said for a purely physical connection, and Winston and Bertie had it. A bus driver by day and a passionate (and quirky… remember the bologna?) lover by night, Bertie gave Winston one of his greatest relationships to date. This is the ultimate relationship just waiting to happen: they understand one another’s passion for their job, Aly compliments Winston’s humor, and Winston said she is the best part of his day. Now all that needs to happen is for Aly to look deep into his Winston’s kind eyes and realize he’s the one for her. No one is getting into Winston’s heart without clearing Ferguson first. Their relationship started off rocky, but through the seasons Ferguson has become the rock in Winston’s life, and theirs is a bond that cannot be broken.